The Suffers are a ten-piece phenomenon from Houston who are redefining the sound of Gulf Coast Soul, intertwining elements of classic soul with rock and roll, packing each position of the rhythm and big horn sections with talent, taste, and punch. Singer Kam Franklin has a, well, massive voice—a must for such a deliberately “horny” outfit. In a short time, the Suffers have progressed from packing Houston venues to rocking the Austin Reggae Festival, Houston’s Free Press Summer Fest, and Paste Magazine’s Untapped Festival, where they’ve shared the stage with the likes of The Wailers, Mavis Staples, and Alabama Shakes. 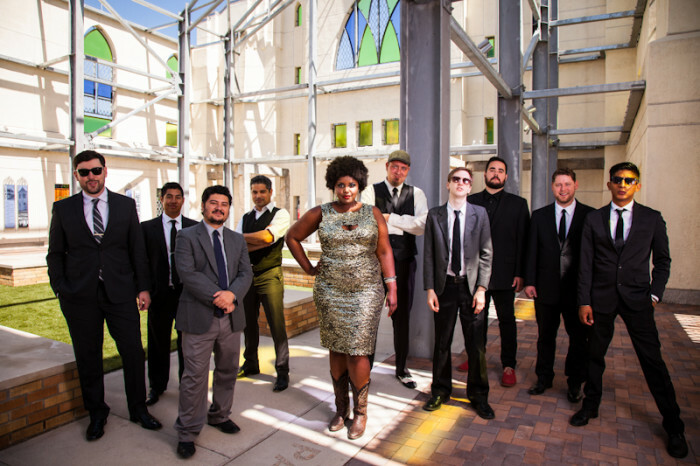 The Suffers have accepted every prestigious music award Houston has to offer and are now taking off around the country. The band’s debut full-length is planned for release in 2015.